The Cubicle Bedder can also be used as a dispensing bucket for both dry feeds and mixed rations. 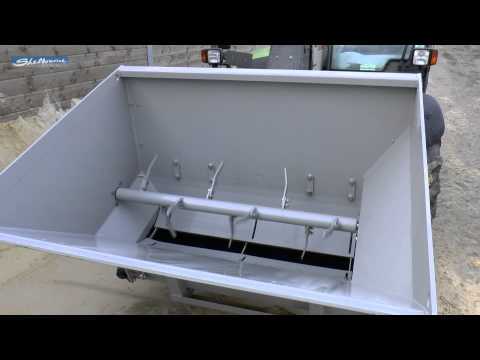 The Shelbourne Cubicle Bedder consists of a rugged welded steel bucket with a 30cm wide hydraulically driven cleated belt running in the bottom. This belt will operate in either direction allowing the operator to bed cubicles on either side of the machine. Rate of discharge can be varied using adjustable internal slides as well as varying the speed of the belt using the tractor/loader hydraulic flow control. A centrally mounted agitator shaft is operated hydraulically above the belt with beater tines to prevent bridging and ensure even feeding down onto the belt. Tines can be removed according to the type of material being used. available either as rear 3-point mounted with hydraulic top link or as front loader mounted versions. Which Shelbourne Cubicle Bedder Suits YOUR Operation? Do you have any buildings with limited access? The CB100 is 5' 4" wide and the narrowest machine in the range.